On the 3rd Friday of each month, we give back to the community by opening our studio to individuals or organizations who feel they have something to offer in the health and wellness community. We’d love to hear from you. You can submit your ideas for an event here. On Friday November 18th at 7:00 P.M. Pilate-Da is hosting our third Friday event featuring Susan Proctor who will be discussing Natural Hormone Balance and Youthful Aging for Woman 50+. Susan Joyce Proctor, DAy, MBA, is passionate about sharing her truth: that a juicy and balanced life is every woman’s birthright, and that we can all align with our divine feminine energy to help create the bodies and world we most desire to live in. She has 24 years of practice and training in Ayurvedic Medicine, personal revitalization experience, as well as a unique ability to share these exciting concepts and she is coming to Pilate-Da to talk about the best tips for helping other women exploring their own path to optimal vitality! This will be a great event you don’t want to miss! Check out the link below to see more of what she will be offering at the event! 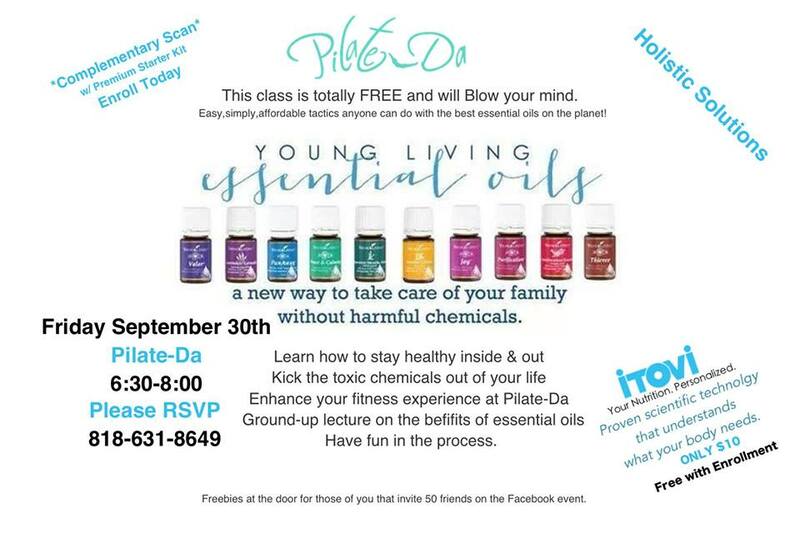 On Friday September 30th, from 6:30-8 PM, Pilate-Da will be hosting an event featuring Young Living Essential oils. Come learn about all of the benefits of and various uses for essential oils! At this event you will learn how you can stay healthy inside and out while kicking the toxic chemicals out of your life and enhancing your fitness experience at Pilate-Da! We will be joined at this event by Debra Hill who is a Young Living Essential Oils Representative. Debra is an amazing source of knowledge regarding this subject, and will be able to teach you about all of the ways essential oils can benefit your life, including using them in your home, for physical and mental wellness, and in your beauty routine. This is an event you don’t want to miss! July 29th at 6:00 PM, Pilate-Da will host an event to introduce our newest class OzzyBall. This original workout, created by Lila Ristevska, is designed for any fitness level promoting health and vitality. 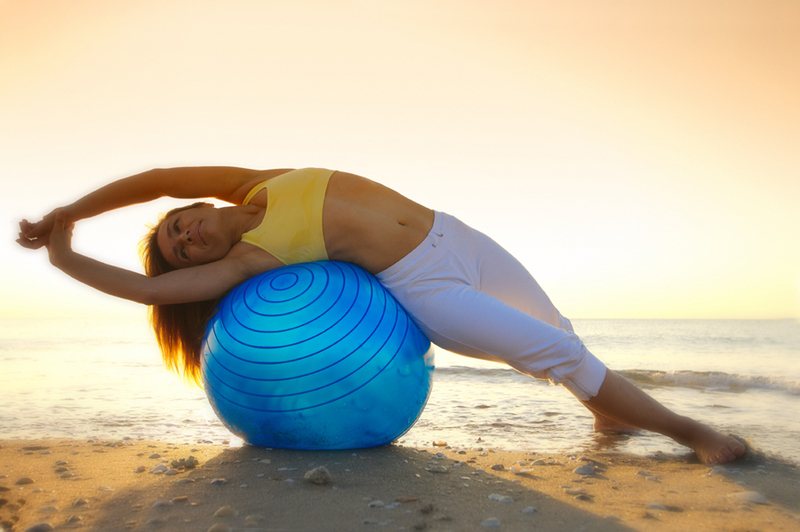 It utilizes a customized exercise ball that stretches while strengthening the body and awakening tight muscles. Lila will teach a short class to familiarize everyone with the OzzyBall System. In addition, Lila will inform everyone about the benefits of Kangen Water®, which is now offered in the studio! After, there will be a Potluck party of Summer Salads. Hope to see you all there! Come learn about GYROKINESIS® from master trainer, Mia Munroe, for Pilate-Da’s June Friday Event! The introduction is FREE and wine and cheese will be provided by the studio. Bring your own potluck dessert for a community open house event afterwards. The GYROKINESIS® methodology is the education that teaches you how to move with confidence throughout your day and feel better doing it. GYROKINESIS® gently stimulates all of your body’s functions by increasing circulation with natural breathing patterns and fluid movements guided within a comfortable tempo and safe range of motion. These easy to learn exercise habits can help with balance, joint pain, fatigue, muscle soreness, and general resharpening of the senses.